November 3, 1952. The Nazi Party has returned in Romania and the paranormal investigator known as Hellboy is dispatched to bring them down. Adolf Hitler has donned a battle-suit and fights the hero directly but his armor’s chest begins to glow. Hellboy senses that an explosion is coming and flees from the scene prior to the huge detonation. He is advised by his colleagues to keep Hitler’s involvement a secret as the dictator’s head bounces away. It is picked up by Baron Blitzkrieg who declares that Hitler had been foolish to take up the fight in person but hopes to save at least his brain. December 21, 1996. BrainiApe awakens to find himself locked up in the Vicious Circle’s new headquarters of Pipetown. PowerHouse informs him that a lot of hard work has been carried out in order to restore BrainiApe after their clash during a bank robbery. CyberFace wishes for BrainiApe to make amends by confronting and eliminating Dragon. This request is rejected but it is pointed out that if BrainiApe does not agree to the assignment then he will remain locked up permanently. The resurrection process via Project: Born Again for CyberFace is revealed to have been a partial failure as he is rapidly decomposing. Abner Cadaver believes there is only days left before he is dead once more and he cannot use his powers to fully restore him. Instead, Cadaver sends out a summons to the legion of the undead in the hope that one amongst them contains the key to saving his leader. CyberFace is then confronted in his quarters by Horde. Unless CyberFace finds a way to extend his lifespan, Horde will step forward from the shadows and assume control of the Vicious Circle. Fast forward to Christmas Day and Dragon is celebrating the holidays with Frank Darling and his family. This is the first time in a couple of years that they have been able to do that considering one year Frank was hiding in New Orleans and the next Dragon was trapped in a smokestack. Alex Wilde stops by with a gift for Dragon, hoping to cheer him up somewhat after the recent death of his son. She turns down the opportunity to stay for dinner due to a prior engagement with Chris Robinson. At a train yard in Chicago, Hellboy interviews Undead Fred over the population of the undead increasing massively in the city. Their conversation is interrupted by Zombie John who accuses Hellboy of having killed his sister. The two zombies end up fighting one another as Hellboy finds himself surrounded by vampire women. An emergency situation soon breaks out and Frank prepares to set off to deal with the mayhem but Dragon insists that he stay with his family. He instead handles the problem on his own and arrives just as Hellboy is battling a Big Mummy. Dragon discovers that he has no control over his body which leaves him vulnerable to a train being thrown into him by the Big Mummy. Hellboy fires off a weapon that blows up both combatants but Dragon eventually emerges from the wreckage. 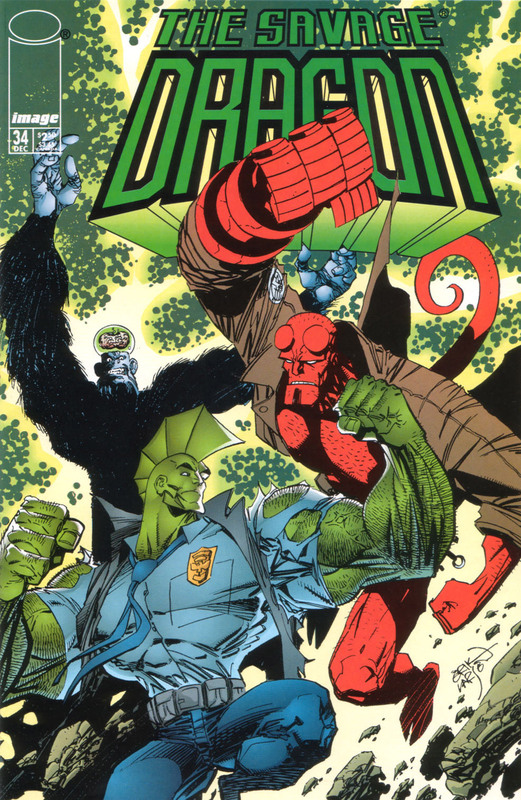 Dragon gets to talking with Hellboy but BrainiApe gets involved, extending his control over to Dragon to also manipulate Hellboy’s movements. The duo come to blows as watching Vicious Circle members depart, satisfied by the influx of undead creatures will provide them with the key to saving CyberFace. BrainiApe recognises Hellboy which instantly reboots his memories of his past life, revealing that he used to be Adolf Hitler.